RML and Chevrolet’s worldwide-winning partnership continued last weekend, with the first victory for Chevrolet Motorsport Denmark (CMD) in 2007. Using an RML-designed and built 2006 Lacetti chassis, Danish driver Henrik Lindgaard visited the top-step of the podium and tasted the first-place champagne at the Jyllands Ring on Sunday, and now sits in sixth position in the Danish Touring Car Championship with 140 points. He and Swedish team-mate Pontus Morth have both been on the podium earlier this season, having taken three third places between them. 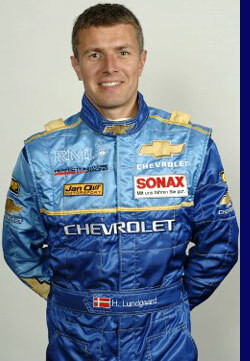 Pontus is seventh in the championship with 126 points. As well as chassis for both drivers, RML provides a full engine support programme to CMD throughout the course of the season. RML can provide a full design, preparation and event support programme or advise teams and individual entrants on set-up and preparation in any race or rally category. With two rounds left in the championship, CMD is fourth in the team championship with 266 points. The next race meeting takes place at Padbord Park on September 22/23.